Hawthorne Power Systems is the industry leader in providing the best customer experience and support in San Diego County. Hawthorne Power Systems, the authorized sales, rental, parts and service dealer for Cat electric power, back-up power, stand-by power equipment, and industrial engines, announces new air compressor solutions. 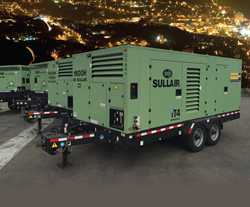 Hawthorne Power Systems is the authorized Sullair portable air compressor dealer in San Diego County, providing a complete source for repair, maintenance, rentals and sales. As a trusted compressed air partner, Hawthorne Power Systems offers service repairs on all brands, $350 compressor repair assessments, and genuine Sullair parts and fluids. Hawthorne Power Systems also provides new and used compressor sales in addition to San Diego’s newest and largest fleet of rental compressors. Need help finding the right solution for your portable air compressor needs? Contact Hawthorne Power Systems today at 858.376.6881. Hawthorne Power Systems is the authorized Cat dealer in San Diego, Hawaii, Guam, Saipan and American Samoa. Hawthorne provides sales, rentals and services for the power generation, marine, trucking and other engine-related markets. It has outstanding skills in building, rebuilding and packaging engines and power systems of all sizes, ranging from truck engines and turn-key generator plants to cogeneration and standby power. For more on Hawthorne Power Systems, visit http://www.hawthornecat.com.